Roll the drums, what you see above is my first ever [tag]masala dosa[/tag]. Sure, its not the size of a small ox but its mine, all mine! I feel so empowered now. I can make my OWN [tag]dosa[/tag] and my OWN dosa filling, I do not have to travel the dosa-challenged countryside of central [tag]Massachusetts[/tag] looking for that one hidden [tag]Indian restaurant[/tag] that serves dosa. “How, Why?” you may ask. For one, when I reviewed the “Modern Indian Cooking” [tag]cookbook[/tag] by [tag]Hari Nayak[/tag] and [tag]Vikas Khanna[/tag], I felt sorta goofy not cooking with even the most fundamental of [tag]spices[/tag]. My [tag]kitchen[/tag] was just not prepared. When I received another [tag]India[/tag]n cookbook called the “[tag]Complete Book of Indian Cooking: 350 Recipes from the Regions of India[/tag]” by Suneeta Vaswani, I decided that the only way to honor the traditional recipes in this cookbook was to adhere closely to them. I suggest that you visit [tag]Suneeta[/tag] [tag]Vaswani[/tag]’s site to learn more about this extraordinary woman. She has dedicated a good part of her life to sharing the [tag]ancient[/tag] and [tag]authentic[/tag] [tag]cuisine[/tag]s of India with the world. She is based in [tag]Houston[/tag], [tag]Texas[/tag] so I will have to read on from afar. I would love to be able to attend some of her cooking classes. As I am not Indian, I have a very narrow experience-base with the vast cuisine that is Indian cooking. This cookbook is expansive in it’s coverage of the four corners of India (and its seemingly infinite varieties of ancient cuisines). One can easily jump into cooking creamy northern [tag]korma[/tag]s to thinner southern [tag]dal soup[/tag]s to [tag]coconut[/tag]-enriched dishes from the coastal regions. What I needed to do was to stick with what my [tag]palate[/tag] knows now from experience with foods prepared by trained cooks. I wanted to make something that I had experience eating so that I could tell if I even came close to achieving a modicum of success. 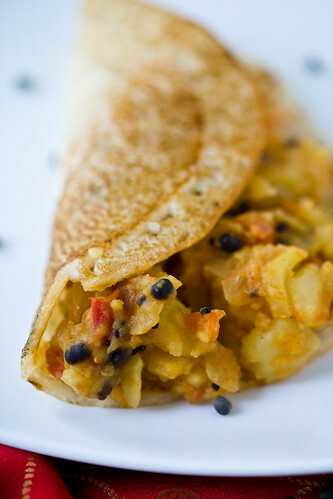 Its for this reason that I chose dosa with [tag]spicy[/tag] potato filling. Preparing these recipes (or any in this cookbook for that matter) meant that I had to find a store that sells quality spices and other Indian ingredients in my relative vicinity and make a spice buy. I found, almost by luck, a shop in [tag]Worcester[/tag], MA called [tag]Ed Hyders Mediterranean Marketplace[/tag] (see a nifty video interview at the store) that as been around for 31 years and which has a fantastic selection of spices. It was my lucky day too because they were having a spice sale this month, I could be a bit more experimental. I will be writing more about Ed Hyders in another post, stay tuned! I bought nearly $100 worth of spices, half off. I didn’t buy much of each though so that I didn’t end up with much unused stale spices. With the guidance of Vaswani’s book, I had the most fantastic success. I can not recommend this book highly enough, even for the neophyte. There is plenty of background on the various regional Indian food, the spices needed, and very clear instructions on how to prepare these delights. This takes 3 days. Be sure to read entire recipe and budget the correct time needed. I am going to paraphrase here. You can download a printable copy at this link. Soak rice overnight in 6 cups (1.5 L) water. Pick through the urad dal for small rocks, etc, and rinse. Place in a separate bowl and add fenugreek seeds and 4 cups (1 L) water. Soak overnight. Drain the dal and rice mixtures (separately). In two batches, blend 1/2 the dal with 1/4 C (50 mL) warm water in each batch. Blend until smooth (about 2-3 mins). Put into a large bowl. In two batches, blend the soaked and drained rice with 1/4 C (50 mL) warm water until VERY smooth. Pour both batches of blended rice into the bowl with the blended dal. Stir in the salt and about 1/4 C (50 mL) warm water to get a cake like batter. Cover and set aside someplace warm to ferment for 10-12 hours (overnight in my case). After this fermentation it is ready to use or can be refrigerated for up to 48 hours. Bring back to room temperature before making dosas. Whip [tag]fermented[/tag] batter vigorously for some 2 mins (it should be fluffy, sort of like baking soda based pancake batter that you let sit a bit before using). Beat and thin with warm water until it is the consistency of heavy cream. You can find no end to videos on the web that show how to make dosa. Here is one. Basically, you need a well seasoned surface, little to no oil, a long very flat [tag]spatula[/tag] (I used an cake icing spatula, its perfect), a 1/2 C scoop and something with a flat bottom like another measuring cup or a heat resistant glass, with which to spread the batter out, in a continuous spiral from the center. Just watch the [tag]video[/tag]! Once made, eat quickly! I suggest adding the potato filling and [tag]coconut chutney[/tag] you see below. The following is an excerpt from the “Complete Book of Indian Cooking“, the copyright for this recipe is all theirs. Fill a saucepan three-quarters full of water. Add salt and turmeric and bring to a boil over high heat. Add potatoes and cook until tender, about 12 minutes. Drain and set aside. In a wok or large skillet, heat oil over high heat until a couple of mustard seeds thrown in start to sputter. Add all the mustard seeds and cover quickly. When the seeds stop popping, in a few seconds, uncover, reduce heat to medium and add cumin and urad dal. SautÃƒÂ© for 30 seconds. Add onions, ginger, curry leaves and chiles. SautÃƒÂ© until onions are golden, 5 to 6 minutes. Add potatoes, cayenne and tomatoes. Add 1Ã¢Ââ€ž4 cup (50 mL) water. Cover and reduce heat to medium-low. Cook until tomatoes soften slightly and flavors blend, for 5 minutes. Potatoes should be soft and semi-dry. Garnish with green onions before serving. Note on presentation:Usually dosas are rolled into more of a tube and have a bit of potato. Mine are overloaded with the potato and look more like breakfast tacos! I know this but they were delicious. I would recommend a sauce that is not shown – Coconut Chutney. I adore this stuff but was not able to make it in time for the shoot because it requires a blender and the baby was napping so I didn’t make it because I didnt want to wake him up! The recipe for this can be found in the book on page 405 and is listed below. 2 sprigs fresh curry leaves (about 20 – 25 leaves) stripped from stems. In a skillet, heat 1/2 tsp (2 mL) oil over medium heat. Add the channal dal and sautÃƒÂ© 2-3 mins. Set aside. In the same skillet, toast the coconut and broken chile (save out that whole 2nd chile). Stir to prevent burning. When the coconut is 2 to 3 shades darker, remove from the heat. Cool then put in a [tag]blender[/tag]. Add the reserved sautÃƒÂ©d [tag]channa dal[/tag], [tag]lime[/tag] [tag]juice[/tag], salt, and 1 C (250 mL) water, blend to a smooth [tag]paste[/tag]. Put into a bowl. Heat remaining 1 T (15 mL) oil over high heat until a couple of mustard seeds thrown in start to sputter. Add the remainder of mustard seeds, cover and cook on high heat until the popping stops. Quickly remove cover, put heat to medium, add cumin seeds, remaining chile, and [tag]ginger[/tag]. TRY not to let any of the mustard cooking fumes waft into your face when you open the cover, potent! Stir 30 seconds and then pour over the blended coconut mixture in the bowl. Stir in well. Put a bit of this on the potatoes in your dosa, take a bite, close your eyes, and you are in heaven! ← Whats in Your Ramen? Great looking as always, Nika! I used to work with a group of Indians, and one of their wives taught me how to make black lentil dal and roti. I make it now and then, and love it. I upset one of the women I worked with when I took it to work; she said it was better than her dal, and she was actually mad that I was able to make roti over an open flame. That was actually one of my first cooking experiments where I realized I could cook. At the market, did you find the really finely ground red pepper? I LOVE that stuff! It’s great on all kinds of things, even vanilla ice cream. Awesome re: your roti! Do you mean ground red pepper corns? cayenne? other sorts of chilies? All I know is that it’s marked hot, and it’s dark red, and says something about being ground chiles. I really don’t know what pepper, but I only get it at an Indian market. Looks fantastic, Nika! 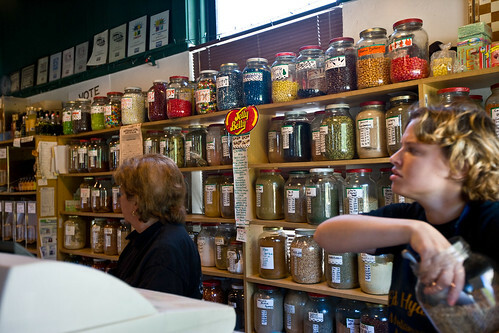 Luckily we have a few Indian grocery stores that are relatively close to us, so makes spice shopping easy. I love the distinct smell that hits you as soon as you open the door to walk in. Coincidentally enough, total craving for Indian food tonight for dinner…. mmmmm. hrmmm .. that is so vague! wonder what it is. Cate: yeah! i love that smell too… i have that smell in my kitchen right now. and, yeah, i am still craving more indian food. let me know when you get this.. my spam karma plugin seems to not like you but i THINK i fixed it,,, thanks for the heads up! Nika, I’m so glad you discovered Ed Hyer’s market — I’ve printed out the address and I’ll be heading there before too long. Worcester seems to have many hidden treasures. I dont think its possible to be well stocked Indian Pantry wise unless you have someone’s Indian grandma along with you when you go to buy things! I think its something you have to do over time. I highly recommend giving it a try! I think I am going to try to make idli next, with sambar, because I miss that hot yumminess. Lydia: Tell me how that goes for you! It does seem like there is a whole lot more to learn about the place. Worcester always chooses to feel inferior to Boston which really holds it back. Heck, Boston aint nothing compared to London or Paris. There is ALWAYS a bigger better fish in the pond. Its better to just figure out what your good at and not waste time thinking if you are anything like Boston. I would not want Worcester to be like Boston, its Worcester! It seems like Providence has transcended that whole dynamic (maybe I am wrong?) and is busy being Providence. what a fabulous blog you have, nika!!!! we’ve added you to our blogroll. Well done Nika!I was getting paranoid about westerners doing South Indian recipes especially Dosa and Idli before coming to your site..
Tongues are simply tickling at your photos .Kudos to suneeta vaswani inspirations. Now I am fluctuating between lurking and delurking . R: I totally understand that paranoia I will not be putting any streetside dosa makers out of business any time soon! Please do not lurk, come on back for more visits! Those look incredible…I wish I had one of them for lunch! OOOh dosa is a special memory. In Washington DC we went to a tiny restaurant where the old mother made dosa at the stove, huge and perfect. Once my son was allowed to stand by and watch. We have found a dosa mix in Indian stores. If you get to Hartford it’s a wonderful place for ethnic groceries. Both cookbooks are tempting. I would suggest another called Indian In 6, by Monisha Bharadwa, and a blog Quick Indian Cooking. Thanks for the recipes — the filling looks especially good. Susan: Thanks for visiting! Last time I was up your way I got stupendously lost. I NEVER get lost but there must be magnetite in your hills or something because I got lost every time I ventured from the hotel. I was there an evening and then part of the next day so I had a weekday morning with nothing to do. 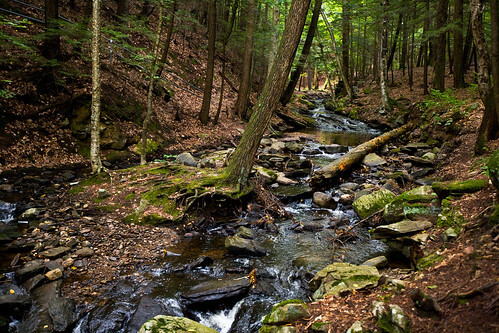 I went up to the Chesterfield Gorge and walked down to the bottom and was alone in such majestic beauty.. you live in a wonderful place! I will definitely check out that book. Do you know the name of the place in Hartford? Its not far from me (maybe 30 mins). 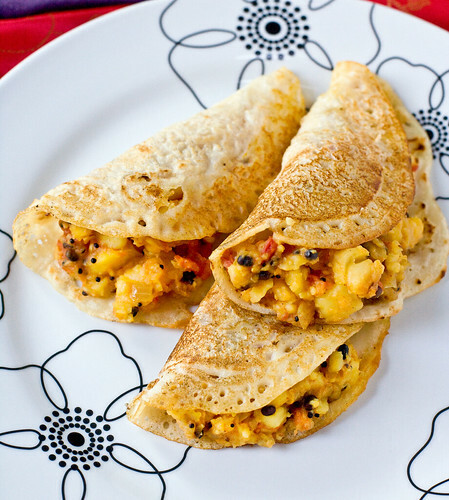 The pictures of dosas are too good. I really feel like tasting the Dosas. I really liked your blog very much. The picture of dosa looks very appealing. Feel like tasting. The fortitude to face Black Friday! Nikas Culinaria is proudly powered by WordPress and BuddyPress. Just another WordPress Theme developed by Themekraft.